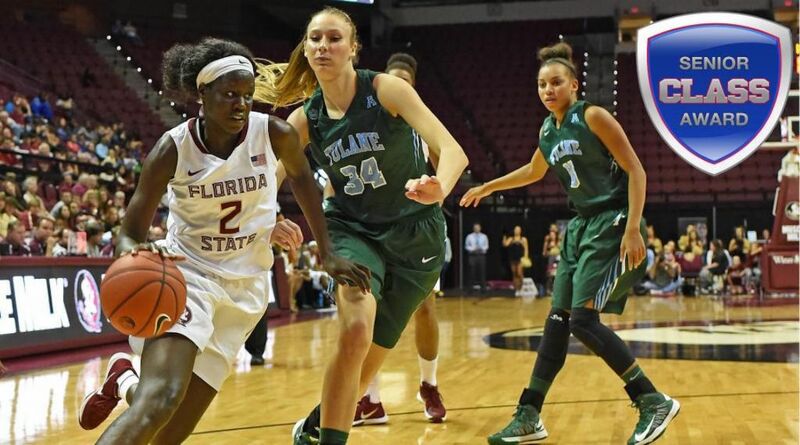 TALLAHASSEE, Fla. (Seminoles.com) — Senior center Adut Bulgak of the Florida State Women’s Basketball team is one of 10 collegiate women’s basketball players who were selected as finalists for the 2015-16 Senior CLASS Award, announced by the selection committee. To be eligible for the award, student-athletes must be classified as NCAA Division I seniors and have notable achievements in four areas of excellence: community, classroom, character and competition. The complete list of finalists follows this release. Bulgak is having another good season for Florida State, averaging 13.5 points, 7.8 rebounds and shooting 49.4 percent from the field. She is second the Seminoles with six 20-point games and leads FSU with six double-doubles this season. The Edmonton, Canada, resident is arguably the top long-range shooting center in the country, shooting 40.5 percent (15-of-37) from beyond the arc in ACC play. Bulgak’s character has never been questioned considering her inspirational back story. She grew up in the war-torn country of Kenya and was forced to flee to Canada as a young child. While her life changed for the better in Edmonton, she endured tragedy as two of her older brother passed away two years apart in 2007 and 2009. She is a sociology major who has devoted several hours to community service during her time in Tallahassee. Bulgak has read to children at elementary schools, visited community centers, cheered at racing events, taught basketball clinics and more. The finalists were chosen by national media from the list of 30 men’s candidates and 30 women’s candidates announced in January. Nationwide fan voting begins immediately to help select the winner, and fans are encouraged to submit votes online at the Senior CLASS Award website through March 21. Fan votes will be combined with those of the media and Division I head coaches to determine the winners. The Senior CLASS Award recipients will be announced during the 2016 NCAA Men’s Final Four® and NCAA Women’s Final Four®.